Chicago Mayor Rahm Emanuel Faces Runoff In Re-Election Bid : The Two-Way The one-time White House chief of staff will face off against a longtime county commissioner in April. 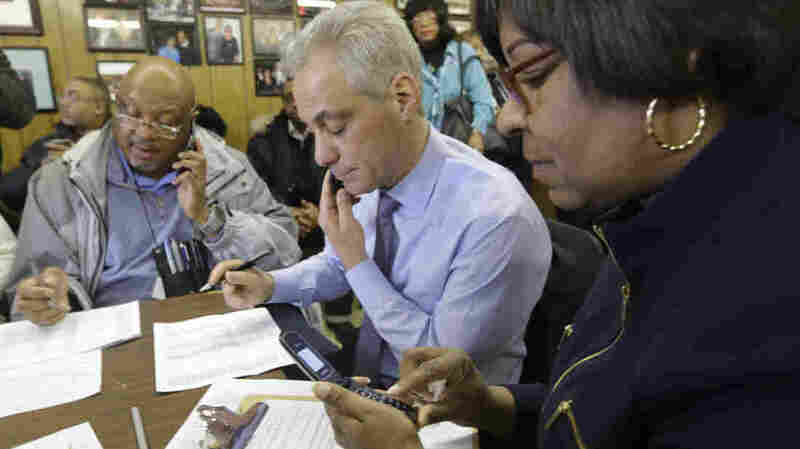 Chicago Mayor Rahm Emanuel (center and 8th Ward Alderwoman Michelle Harris join phone bank workers Tuesday on Election Day in Chicago. Emanuel was unable to clear the 50 percent threshold in the race, triggering a runoff election against a fellow Democrat in April. Amid turnout of only a third of registered voters, Chicago Mayor Rahm Emanuel is headed for a runoff in his re-election bid, according to figures released by the Chicago Board of Election Commissioners. With 98.6 percent of precincts reporting, the former congressman and chief of staff for President Barack Obama leads with 45.37 percent of the vote, followed by Democratic Cook County Commissioner Jesus "Chuy" Garcia with 34 percent. Emanuel required a vote of 50 percent plus one to avoid a runoff. The runoff election with Garcia is scheduled for April 7. "On the campaign trail, Emanuel said his first term saw some tough decisions and payoffs, including budgets that didn't rely on property tax increases, drawing business to the city, getting a longer school day and raising the minimum wage. "But his critics pointed to some of the more tumultuous parts of his time in office, including the city's first teachers' strike in 25 years. The following year in 2013, he pushed for the closure of dozens of schools to save money, which angered parents and activists throughout the city's neighborhoods."